"Growth has stalled in Europe, and there is a risk of a new recession." 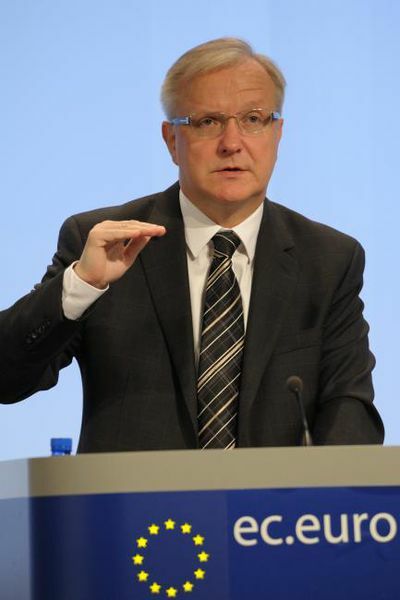 Before telling this, EU Economic Affairs Commissioner Olli Rehn drank a glass of cold water and asked the reporters: "Please, do not kill the messenger!". 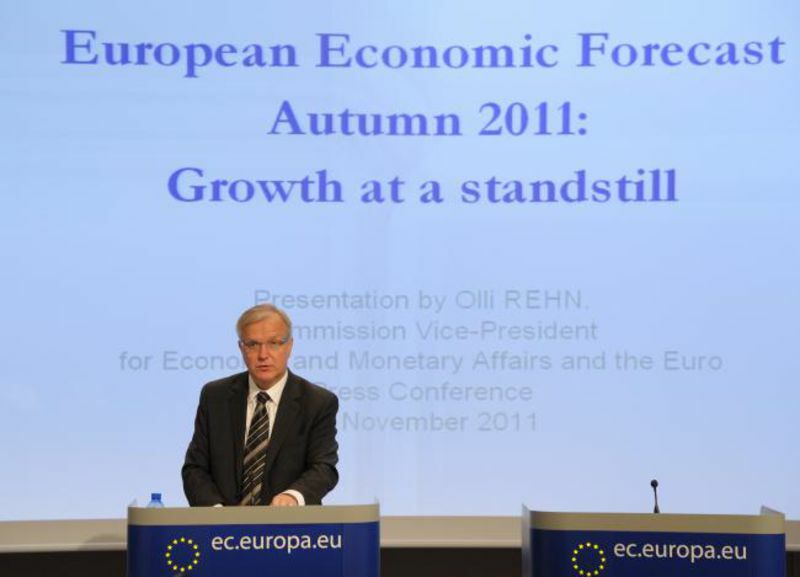 The Commission’s autumn economic forecast states unequivocally: the economic recovery has come to a standstill. The annual growth will reach only a half percent (0.5%) in 2012. Unemployment will remain high at around 9.5%. Inflation will return to below 2% (from the current 3%), while if the current policy course is maintained the budget deficits will be reduced to the limit of 3% of GDP by 2013. The EU indebtedness will reach a peak of 85%, while the eurozone debt will exceed 90% of GDP. 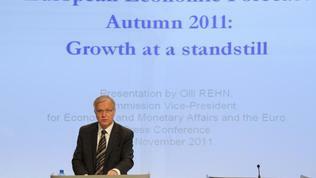 In the words of Commissioner Rehn, the reason for all these economic woes is the lack of confidence. This "crisis of confidence" is affecting investment and consumption, weakening global growth is holding back exports, and urgent fiscal consolidation is weighing on domestic demand. "The weakening real economy, fragile public finances and the vulnerable financial sector appear to be mutually affecting each other in a vicious circle. Confidence and growth will only return once this negative interaction is interrupted," the Commission noted. The data for the two countries that cause greatest concern at the moment - Greece and Italy - are not encouraging. The Greek economy will shrink by 5.5 percent this year and by 2.7% next year. In 2012 unemployment will reach 18.4%. From nearly 9% this year, the budget deficit is expected to fall to 7% in 2012. The Greek debt, however, will continue to grow, reaching nearly 200% of GDP over the next two years: 2011- 162.8% of GDP, 2012- 198.3% of GDP, 2013- 198.5% of GDP. The current account deficit will fall by about 2 percentage points - from nearly 10% this year to around 8% next year. 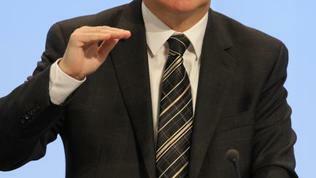 Italy expects symbolic economic growth of 0.5% this year and the paltry 0.1 percent in 2012. The budget deficit of 4% this year will fall below 3% next year. Over the next two years the Italian debt will decline slightly from 120.5 percent of GDP in 2011 to 118.7 percent in 2013. The current account balance will remain negative in the amount of - 3.6% of GDP this year and -3% in 2012. On Thursday, the ten-year Italian bonds yields rose to 7.4 percent and then fell back close to 7 percent only because of ECB's intervention on the market. This is above the levels at which the countries rescued so far had to ask for help from the euro area. So it was quite logical Mr Rehn to be asked whether he expected Italy to request assistance from the rescue fund EFSF and in what form – as a credit line or as a market intervention. Of course, the Commissioner did not answer the question directly but explained the risks of a continuing increase of the interest rates: "A persistent increase by 1 percentage point in bond interest rates would imply additional interest expenditure amounting to around 0.2 percent of GDP next year, in 2012, and 0.4 percent in 2013." "In case of an entire pass-through to the economy of this 1 percentage point increase in interest rates on government securities, the real GDP level could be up to 1 percentage point lower after three years." The Commissioner reiterated that "the first and foremost thing for Italy, is to restore political stability and capacity of decision-making," in order to take the necessary fiscal measures and structural reforms. "The key for the resumption of growth and job creation is restoring confidence in fiscal sustainability and in the financial system and speeding up reforms to enhance Europe's growth potential. There is a broad consensus on the necessary policy action. What we need now is unwavering implementation. On my part, I will start using the new rules of economic governance from Day one," Commissioner Rehn stated. However, the tools of the new economic governance can only have a long-term and preventive effect but cannot solve the current dramatic problems of Europe. According to the Commission's autumn forecast, the risks to the European economy are still stemming from the debt crisis and the financial sector: "There is potential for negative dynamic interaction: the weaker growth hinders countries debtors whose weakness affects the health of the financial sector." Against the expectations of a week growth, the implementation of budgetary consolidation measures appears to be more and more difficult because without real economic growth the possibilities for savings will soon be exhausted and the budget gaps will be wide open again.